Spawningtool3 marines vs lurker, round one: FIGHT! We definitely forgot to actually implement pagination. Thanks for pointing this out! We patched this last night, so you should see "Next" and "Previous" links at the bottom of the search results now. Is that working for you? I want to play "ByuN v viOLet: Game 1 - King Sejong Station LE" build (http://lotv.spawningtool.com/23524/) in this tool, but it's not the list. Can you help me how to do that? Quick update in the Spawning Tool Build Advisor: we got a lot of feedback about wanting more context about build orders, so we added a new page into the app so that you can see the full description of the build order that you pick. Let us know if you have any other feedback for us, either in this thread or on our new Discord server https://discord.gg/c4snrRz . Drop by to chat with either myself or Morn_sc! i played around with this overlay & a few things i thought were that it'd be nice if we could import our own build orders into this overlay, either from previously downloaded replays from the spawingtool site or manually inputted from our own notes. Also as previously mentioned, there seems to be 100's more builds/replays to choose from on the website than are available within the overlay. For instance while within the overlay, if you search for: 'mech', you quickly realize theres not many there to choose from & you'll quickly find HOTS builds in the list. Being able to chose between the expansions would be nice too, or being able to filter them out. 1. Good point. Right now, the app is pretty limited in terms of input. 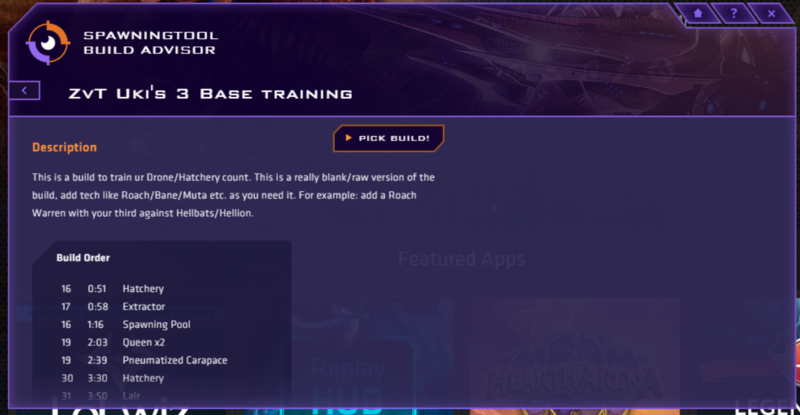 The builds available should be the same set of ones available at http://lotv.spawningtool.com/build/ , and you're welcome to publish more build orders there to get them into the overlay. Unfortunately, you currently can't browse build orders out of replays directly, but it's pretty straightforward to copy build orders from replays on our site into the build orders section. 2. There definitely shouldn't be HotS builds in there because those are in separate databases. Do you remember a specific build that you saw that didn't look right? Is there anyway you can rebind the hotkey to pull it up? Q is where I like to hotkey my Mothership Core but if I'm using this app I would have to use a different hotkey for that control group. I can't seem to get this app to work in Windows 10, the problem seems to be the "focus"on the overlay making the game not respond to my mouse anymore. The pointer changes to the overlay one and doesn't seem to notice me "clicking back into" SC. I've tried reinstalling Overwolf + the overlay and tried all possible alt+tab combinations to get it working but no luck so far. I hope you guys can help me out because I really do want to improve my game by getting familiar with some builds. EDIT: Got some help via the discord channel and got it working !!! Sorry to necro this thread, but the app suddenly stopped working today where it was working just fine over the weekend. Could this have anything to do with the new patch, though it sounds unlikely as it's different program. I am able to start overwolf and the app just fine, I am able to filter my favorite builds, but I am unable to select any of them. It seems it is not responding to my clicks in the app. There is no shame in defeat so long as the spirit is unconquered. | Cheering for Maru, Innovation and MMA! Sorry for the response that is just as slow here on tl. This bug should be addressed, but let me know if you are still running into it ! As previous users have mentioned, this app no longer works properly.